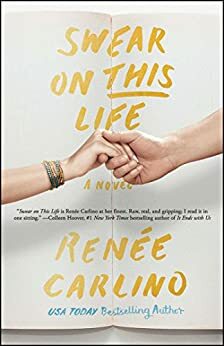 ‘Swear on This Life’ is the first novel I have read by Renée Carlino and I loved it. It drew me in and flowed so well, I had a hard time putting it down. It is an emotional and deep second chance romance that will capture your heart. Through the retelling of the past and the reactions to this in the present, the reader will follow Emi’s journey to forgiveness and more importantly love. What a great book! 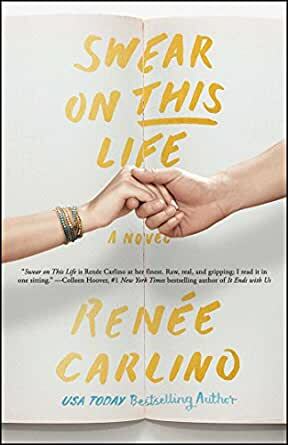 I am currently on a Renee Carlino book binge and loving every one of her books so far. This ladies writing is so versatile every book is completely different. I loved Swear on This Life and I wish I could give it more than 5 stars. The story covers the life of Emiline and Jase from their childhood through to adulthood. They were everything to each other growing up and were each others firsts. Their lives were ripped apart at the age of 15 and Emiline did not hear from Jase in 12 years until she reads a book by a new Author J. Colby which is a best seller. Once Emiline starts reading the book she realises the book is actually her life written from her perspective. This is a book, within a book, within a book. I loved every minute of this book and will definitely recommend this to all my friends to read. A book I will reread. I have found a new Author to add to my favourite Author list! I did not expect it. This book is amazing. It's a must read for all teenage boys and girls and their parents. What we do with our lives early on - we pay for later big time. What we do to our kids - we pay for in triple. We all hope to find the one and only and to keep them forever. I bought this book based on the reviews and I'm so glad I did. By the fifth page I was so drawn into Em and Jax's story I couldn't wait to find out more. The characters were so likeable, and I loved the banter between Jax and Em. I can't wait to read more of Renee Carlino's work. If you like epic love stories with all the feels and amazing writing then this one's for you. Loved it from beginning to end. This is a truly beautiful story. So well written and easy to follow. I read this in one sitting. The characters were all so well described and very endearing. Would definitely recommend this book. I did enjoy it but there were moments I wanted more. I can't quite put my fingers on what I wanted or why but I did. Still a good read though.